A couple of weeks ago, I got a FitBit! A FitBit is one of many different kinds of pedometers, fitness devices worn on your person that track how many steps you take each day. The recommended number of steps for an active, healthy lifestyle is 10,000 steps. And FitBit allows you to create an account and add your friends to cheer each other on and encourage healthy competition. I was really excited to get it, certain that I would soon be bragging to my family and friends how I get my 10,000 steps in every day without even trying! 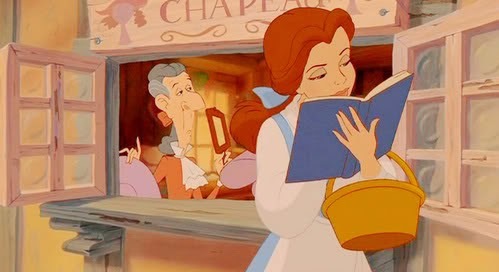 Walking and reading: Belle's got it down. Of course I took 10,000 steps a day, I thought. Between tidying up the department, walking patrons to the shelves, leaving on outreach visits, and trekking across the hall to pick up print jobs several times a day, I thought it would be no sweat. What I found is that unless I go for an exercise walk, I typically take about 4,000-6,000 steps a day. Visit your stacks. Something is always in need of straightening. Even if you have enough pages to keep everything in tip-top shape, you never know what you'll find when you go visiting in the stacks. Remember those five copies of a state award nominee you ordered three years ago? Maybe some of them can be weeded. And - oh look! - you spotted a favorite book you'd forgotten about! One that will be perfect for booktalking to that third grade class next month. Take a walk around your room. Have you checked to see if you need to replace any outlet covers? Are all the chairs looking nice? Do the puzzles have any missing pieces? Here's your excuse to take a minute and make sure your room's in good shape. Visit your storage. When's the last time you were back there, anyway? Go take a look and see what can maybe be thrown out or given away. Trips to the recycling bin will help you get in even more steps. Visit other departments. Do you know what's going on with Adult Services? Have you asked someone in Circulation how things are going? What is your teen librarian up to? It's always great to connect with other departments; you never know what partnerships might develop. Take a stroll with an audiobook (on your break or after work). Audiobooks are wonderful for squeezing in some reading time and getting some exercise. Chances are you sometimes get patrons needing some audiobook listeners' advisory, so keeping up with audiobooks can help you with that, too. ETA (8/6/14) Take over the holds pull list or duties pulling books for teacher collections or offer to pull books for someone's program display. I got a ton of steps in this week from wandering the stacks pulling books for third grade teachers to teach character traits and themes! I need all the help I can get, so give me your great ideas for getting your steps in at work! I love my FitBit! I volunteer at the library twice a month, running the trace report. I thought I walked a lot in my 3-hr shift but not so much. A mile, 1.5 maybe.